This large and impressive chapel was built in 1879, to the design of G .B. Ford of Burslem and built by Messrs W. & J. Gethin of Shrewsbury, for a congregation who wanted a more elegant and suitable structure. It is in the Italianate style, and built of plain and moulded bricks and was designed to hold 630 worshippers. The total cost was about �000. The interior contained particularly fine woodwork by Landucci. The foundation stones were laid on the 8th July and the chapel opened on the 31st August 1879 . 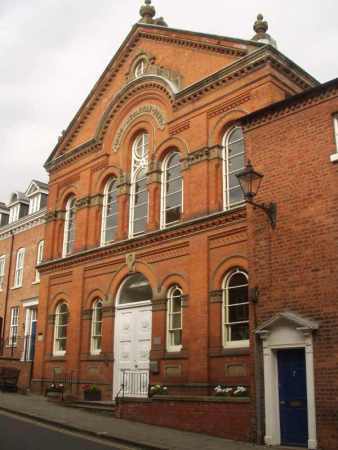 The chapel closed c. 2005 & was put up for sale and has since been converted into apartments. This building replaced a chapel which had been built in 1805 on the same site, at a cost of about �00, and accommodated about 700 worshippers. It had been described by contemporaries as "handsome and spacious", and contained galleries and a small organ. This chapel was enlarged in 1825 to double its size, at a cost of over �00. The chapel was lit with gas, and "fitted up in a style of elegant simplicity and will contain about 1400 persons" and had 250 free sittings. The chapel re-opened on Friday 4th February 1825. In 1879 it was described as "inconvenient, badly lighted and unsightly". The first Wesleyan Methodist chapel had been built in Hill's Lane in 1781, and was opened by John Wesley himself. For views of the interior of the 1879 chapel before it was stripped of all its furniture, click here and here.